A young Emily Dickinson, sometime around 1846-1847, for many years the only known photograph of her. Emily Elizabeth Dickinson (December 10, 1830 – May 15, 1886) was an American poet. Though virtually unknown in her lifetime, Dickinson has come to be regarded, along with Walt Whitman, as one of the two quintessential American poets of the 19th century. Dickinson lived an introverted and hermetic life. Although she wrote, at the last count, 1,789 poems, only a handful of them were published during her lifetime- all anonymously and probably without her knowledge. Emily Dickinson was born in Amherst, Massachusetts, to a prominent family well known for their political and educational influence. Her grandfather, Samuel Fowler Dickinson (1775 – 1838), was one of the founders of Amherst College, whose campus stands less than a mile from the family's home. Her father, Edward Dickinson (1803 – 1874), was a lawyer and treasurer for the college. He was also politically prominent, serving on the Massachusetts General Court from 1838 to 1842, the Massachusetts Senate from 1842 to 1843, and the U.S. House of Representatives (to which he was elected as a Whig candidate in 1852). The poet's mother, Emily Norcross Dickinson (1804 – 1882) was quiet and chronically ill.
William Austin Dickinson (1829 – 1895), usually known by his middle name, was her older brother. He later married Dickinson's most intimate friend, Susan Gilbert, in 1856, and made his home next door to the house in which Emily lived most of her life. Their younger sister, Lavinia Norcross Dickinson (1833 – 1899), often known as "Vinnie", encouraged the posthumous editing and publishing of her sister's poetry. Dickinson lived most of her life in the family's houses in Amherst, which have been preserved as the Emily Dickinson Museum. In 1840, Emily was educated at the nearby Amherst Academy, a former boys' school which had opened to female students just two years earlier. She studied English and classical literature, learning Latin and reading the Aeneid over several years, and was taught in other subjects including religion, history, mathematics, geology, and biology. In 1847, at 17, Dickinson began attending Mary Lyon's Mount Holyoke Female Seminary (which would later become Mount Holyoke College) in South Hadley. Austin was sent to bring her home after less than a year at the Seminary, and she did not return to the school. Some speculate that she was homesick, however there is also speculation that she refused to sign an oath stating she would devote her life to Jesus Christ, and realized she no longer wanted to attend there, went home and never returned. After that, she left home only for short trips to visit relatives in Boston, Cambridge, and Connecticut. For decades, popular wisdom portrayed Dickinson as an agoraphobic recluse. New scholarship suggests that while she was not necessarily an overly sociable person, she certainly valued her friends. Susan married Dickinson's brother Austin Dickinson in 1856, though Susan and Emily had known each other earlier. Emily asked Susan to critique her poems, at which she began working harder than ever. Dickinson died on May 15, 1886. The cause of death was listed as Bright's disease (nephritis). Upon her death, her family found 40 handbound volumes of more than 1700 of her poems. 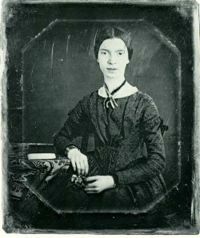 Emily Dickinson, sometime around 1850, (supposed to be) the second and only other known photo of her. Curators at the Emily Dicksinon Museum deny its authenticity. Dickinson's poetry is quite often recognizable at a glance, and is unlike the work of any other poet. Her facility with ballad and hymn meter, her extensive use of dashes and unconventional capitalization in her manuscripts, and her idiosyncratic vocabulary and imagery combine to create a unique lyric style. Over half of her poems were written during the years of the American Civil War. Many suggest that the Civil War gave some of the tense feeling in her poetry. Dickinson toyed briefly with the idea of having her poems published, even asking Thomas Wentworth Higginson, a literary critic, for advice. Higginson immediately realized the poet's talent, but when he tried to "improve" Dickinson's poems, adapting them to the more florid, romantic style popular at the time, Dickinson quickly lost interest in the project. By her death (1886), only ten of Dickinson's poems (see: Franklin Edition of the Poems, 1998, App. 1) had been published. Seven of those ten were published in the Springfield Republican. Three posthumous collections in the 1890s established her as a powerful eccentric, but it wasn't until the twentieth century that she was appreciated as a poet. Dickinson's poetry was collected after her death by Higginson and Mabel Loomis Todd, with Todd initially collecting and organizing the material and Higginson editing. They edited the poems extensively in order to regularize the manuscripts' punctuation and capitalization to late nineteenth-century standards, occasionally rewording poems to reduce Dickinson's obliquity. A volume of Dickinson's Poems was published in Boston in 1890, and became quite popular; by the end of 1892 eleven editions had sold. Poems: Second Series was published in 1891 and ran to five editions by 1893; a third series was published in 1896. Two volumes of Dickinson's letters, heavily edited and selected by Todd (who falsified dates on some of them), were published in 1894. Because of her frequent use of common metre, many of Dickinson's poems can easily be set to tunes (for example "I heard a fly buzz when I died- / The Stillness in the Room / Was like the Stillness in the Air / Between the Heaves of Storm"). Dickinson’s poetry has been used as texts for art songs by composers such as Aaron Copland and Nick Peros. Because of this, one can also sing many of her poems to the tunes of "Amazing Grace," "The Yellow Rose of Texas" or the "Gilligan's Island" theme song. While this novelty is entertaining in itself, it also demonstrates the connection between poetry and song embodied for centuries in the ballad. Sewall, Richard B. The Life of Emily Dickinson. New York: Farrar, Strauss, and Giroux, 1974. ISBN 0-374-51581-9. Shurr, W, Dunlap, A and Shurr, E (Eds. ), "New Poems of Emily Dickinson". Chapel Hill: University of North Carolina Press, 1993. ISBN 0-8078-2115-2 (and others).